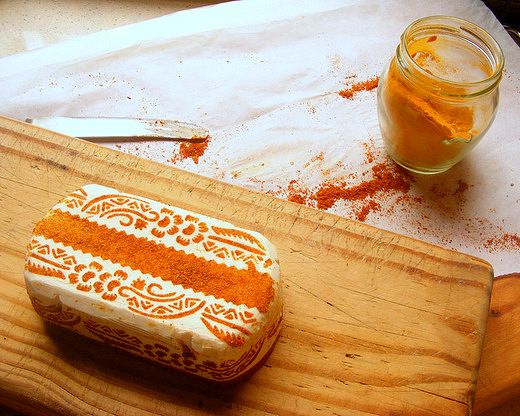 A stencil designed for applying henna to hands and feet is what I used to create the pattern on this block of cream cheese, which is spiced with sumac and fragrant curry powder, with a little turmeric and paprika for colour. Doesn't it look beautiful and whimsical? 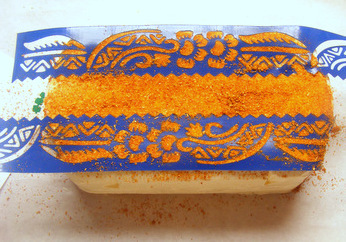 Cream cheese stencilled with spices. The idea for this came to me in the middle of the night, as I lay awake thinking - as I usually do - about food and recipes. In particular, I was mulling over the Four-Pepper Cream Cheese I posted recently on this blog. It was tasty enough, with its four stripes of different peppers, but it just didn't look as pretty as I'd envisaged. 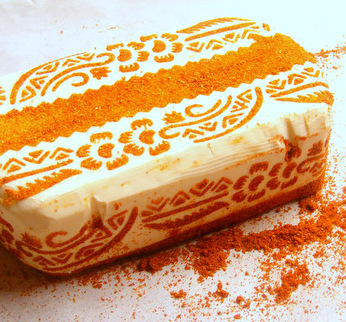 So I set my sleepless mind to this task: how could I create a delicate and interesting design of spices on a cheese? I knew a stencil of some sort was needed, but the only ones I had were big acetate wall stencils from the 1980s - do you recall that era of ragrolling, sponging, stippling and stencilling? - and my treasured stash of old-fashioned paper doilies. Then I remembered - hallelujah!- that I'd bought a pack of henna stencils, from one of Johannesburg's Chinese markets, a year or so back. They were perfect for the job, being light, flexible, slightly sticky and cut with great precision. You can use any cream cheese for this, provided that it comes in a block firm enough to be stencilled. I used Lancewood's Superior Cream Cheese; if you can't find this, use Philadelphia Cream Cheese. Any combination of your favourite spices will do, as long as they are ground finely enough to create even coverage: I used a slightly darker blend of spices on the edges of the cheese. Ask for henna stencils at your local Asian market or spice shop, or order them online. Before I put the stencils in place, I smoothed the top of the cheese with a warm knife to erase the brand name, which is - annoyingly - embossed on top. The top was stencilled first, and then I turned the cheese on one long edge and stencilled the sides one by one. I imagine these stencils would be lovely to use, with cinnamon, on top of an unbaked cheesecake. I served this with salty crackers, crunchy little gherkins and some sweet chilli sauce. You are a grazed, evil genius!! I *love* it!! I do not know where you get time for these little details, but it does look great. You are very creative. Thank you, my friends. Jeanne, I don't mind been a grazed evil genius! Grazing is what I'm really good at. This is simple a divine idea and definitely not something I would have thought about!! What a beautiful result and a great idea! I love the idea with cheesecake. I'll be on the lookout for stencils like that from now on. So exquisite. What a wonderful idea. Takes cheese and crackers from mundane to fabulous. Beautiful Juno! Going through your recipes is like stumbling into a little treasure trove. Hello Lisa! Thank you for your lovely comment, and apologies for not replying sooner. I hope you see this message. PS If you can't find it, let me know and I will post you some spice blends - it's not like they weigh much. Jane-Anne, thank you so much for your timely response and gracious offer. We can indeed get Rajah's curry powder here in the US. I will send him to our local SA import store to pick some up and try a cream cheese with that.